Staples High School students and Westport jewelry store J L Rocks, Westport clothing store Wishlist and Saraswati's Yoga Joint in New Canaan recently raised $5,000 for the Make-A-Wish Foundation of Connecticut through the sale of T-shirts. The students designed a logo stating "Live In A World You Wish To Live In" for the T-shirts and sold them throughout the community. Pupils involved in the project included Staples sophomores Elizabeth Cowell, Elizabeth Camche and Abbey Fernandez. 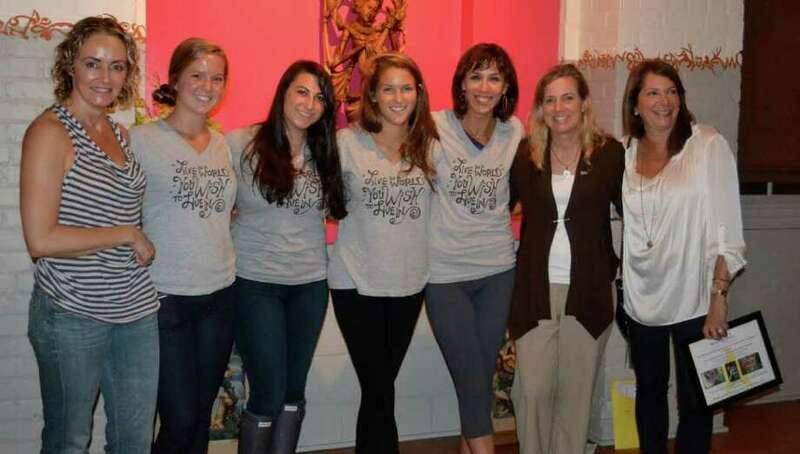 Tracy Bleier and Donna Jackson, co-owners of Saraswati's Yoga Joint; Jamie Camche, owner of J L Rocks; and Suzanne Zarrilli, co-owner of Wishlist, promoted the fundraiser at their businesses and in their respective communities. The Make-A-Wish Foundation of Connecticut grants the wishes of children with life-threatening medical conditions.